Editor’s Note: This article first appeared in our now highly collectible out of print American Blues Scene Magazine, edition Volume 5 Issue 1 of 2015. With this year’s Bridging the Blues in full swing with The Mighty Mississippi Music Festival kicking off tomorrow in Greenville, Mississippi (Sept. 30-Oct. 2) , and the 31st annual King Biscuit Blues Festival in Helena, Arkansas (Oct. 5-8), it is as relevant now as when it first appeared. We hope y’all enjoy it, especially those reading it for the first time. 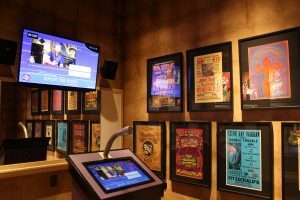 We also hope fans will make the Gateway to the Blues Museum in Tunica, Mississippi a stop on their musical adventures as they travel this culturally rich region of our country. 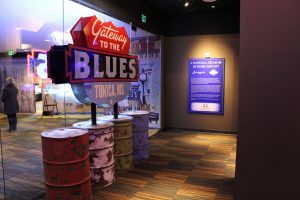 By the time you’re reading this, the state-of-the-art, beautiful, brand new Gateway to the Blues Museum will have just opened in Tunica, Mississippi. 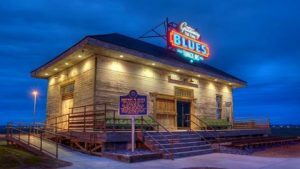 Packed with signed blues memorabilia, locally hand-painted folk art, and complete with a fun recording studio, Gateway to the Blues is now a must-stop on the ever-expanding blues trail. 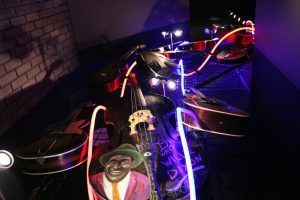 Conveniently placed on the historic Highway 61 and nestled among Mississippi’s beautiful cotton fields, Gateway is packed full of blues memorabilia, a world-class collection of amazing instruments from the best in the blues, and a new spin on the blues museum. One where you don’t need to go home and buy a guitar after your visit to be inspired… you can discover how to make great music right in the museum, and lessons are only the cost of admission! Blues fans making the pilgrimage to the delta that travel south from Memphisland cannot miss the Gateway’s giant neon sign, forged in the shape of the mighty Highway 61 sign, rising proudly from the cotton fields, welcoming visitors with a powerful message: You’re entering the home of the blues. The tour begins and ends in a century old one-room train station. In true blues fashion, the ancient station was salvaged from the land and painstakingly moved up 61. It was first transported from its original location in Dundee, Mississippi, adopted by the Tunica Convention and Visitor’s Bureau, and re-purposed to become the museum’s gift shop, creating a fascinating authenticity from first sight. Hand-painted murals in the entrance to the museum warmly welcome visitors with the area’s signature folk art style. With the opening only weeks away at the time of this writing, paints and brushes from local artist Lamar Sorrento littered the credenza. From the first step through the glass doors, Memphis “Bluesman” Preston welcomes visitors to the Gateway, and offers a lesson in slide guitar, with a real, tuned, playable slide guitar, ready and waiting for curious visitors. Authentic blues memorabilia lines the spaces; a Little Walter inspired harmonica collection with dozens upon dozens of signed harmonicas is presented in a stunning collection; old Victrolas display ancient original Sonny Boy Williamson records– then visitors will find themselves immersed in the deep delta blues. Inviting folk art shows the delta’s most famous residents in a diorama of delta charm: crickets chirp, stars shine, painted faces of Muddy Waters, Robert Johnson, B.B. King, and Charley Patton invite listeners to enjoy collections of valuable memorabilia on each. Perhaps the crown jewel to this collection, and the reason for every self-respecting music lover to make the trip to Gateway is its powerful collection of authentic signed guitars and memorabilia. 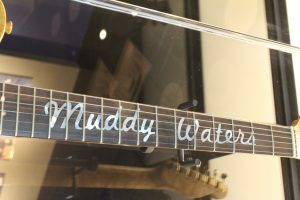 From Bo Diddley’s culture-shifting cigar box guitar to Jimi Hendrix’s famed leather jacket, the second half of the museum is a treasure trove of exciting, colorful and engaging pieces of rock history that would give any Hard Rock Cafe a run for its money. A “Blackie” signed by Clapton, Chuck Berry’s signed red Gibson ES-335 and the many other jaw-dropping guitars aren’t the only reason to stop in. Among the most eclectic pieces of music history might be Memphis Minnie’s original grave marker, a thin piece of wood with hastily hand-written letters for which the word modest would be an overstatement. The marker is a bittersweet reminder of a past era’s entrenched marginalization of even the most influential culture-makers, now permanently on display to not only give viewers a more complete sense of the hardships endured by musicians, but an opportunity to contemplate and pay respects to one of the greatest female voices of the 20th century. Visitors can also enjoy seeing the coronet of the father of the blues, W.C. Handy. The popular musician was the first to describe the blues, having heard it just miles down the road from gateway’s location in the tiny Tutwiler, Mississippi. From that first interaction, which Handy described in his autobiography, he began penning the twelve-bar blues compositions that are still played today. Among other treasures are a hand-written song book from Lightnin’ Hopkins, a signed B.B. King Gibson “Lucille” guitar, and much, much more. The new Gateway to the Blues Museum represents fresh, exciting innovation and investment in the genre in a way that will continue to bring fun, education, and admiration for the blues to generations of travelers, fans, and the blues man and women who still make their way down the famed delta stretch of Highway 61. The biggest upcoming event, is the 5th Annual #BluesTweetUp, on October 5th, 2016. Visitors get the full Gateway experience inside, and also enjoy live performances on the front porch. Terry “Harmonica” Bean, and the “King of Beale Street,” Preston Shannon will perform from 3:30 to 8:00 pm.